Most adults say they spend less than $100 a month on health care. Men are 10% more likely to have never neglected care compared to women. The poll, which surveyed 4,400 adults from March 13-17, also revealed disparities in health care spending patterns along income lines and age. Per the Centers for Medicare and Medicaid Services’ annual report on health spending, household spending on health care reached $980 billion in 2017, for an average of $266 per person per month. But that spending is not evenly distributed. In 2016, an analysis of the 2016 Medical Expenditure Panel Survey found 5 percent of the population accounted for 50 percent of all health spending. Fourteen percent of respondents in the Morning Consult/Business Insider poll report spending at or above roughly the CMS-calculated average, or more than $250 a month, on health care, while more than half spend less than $100, with significant variation across socioeconomic status and age. This data supports research that has found income is a predictor of both the magnitude and category of health care spending. Wealthier people tend to be healthier, as their disposable income allows them to invest in preventive health treatments and primary care services, while adults under financial strain eventually pay the price for neglecting routine care in the form of diminished health outcomes and expensive emergency care. 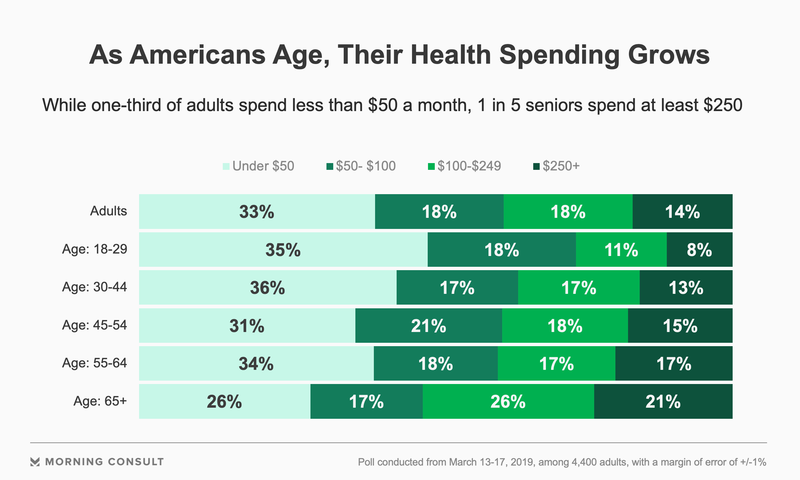 The Morning Consult/Business Insider poll found that 29 percent of adults with an income above $100,000 said they spend $250 or more per month on health care. Forty-four percent of those high-expenditure people spend more than $500 a month. Meanwhile, 70 percent of adults earning $100,000 or less spend under $250 a month. Among adults with an income below $50,000, just 8 percent spend over $250, while 56 percent spend shy of $50 a month. Beyond income, predictors of higher health care spending include education status, age and race. In the poll, more than twice as many white adults spend upwards of $250 than black adults (16 percent to 7 percent). And while just 8 percent of adults ages 29 and younger spend $250 or more, that share nearly triples to 21 percent among seniors. Despite spending $3.5 trillion on health care in 2017 — more than any other country in the world — the United States consistently lags behind comparable nations on a number of population health measures, including hospital admissions for preventable diseases. Adults at or above 65 years old, which is the Medicare age of eligibility, are the only age group without a majority reporting that they have delayed or gone without care because it was too expensive. 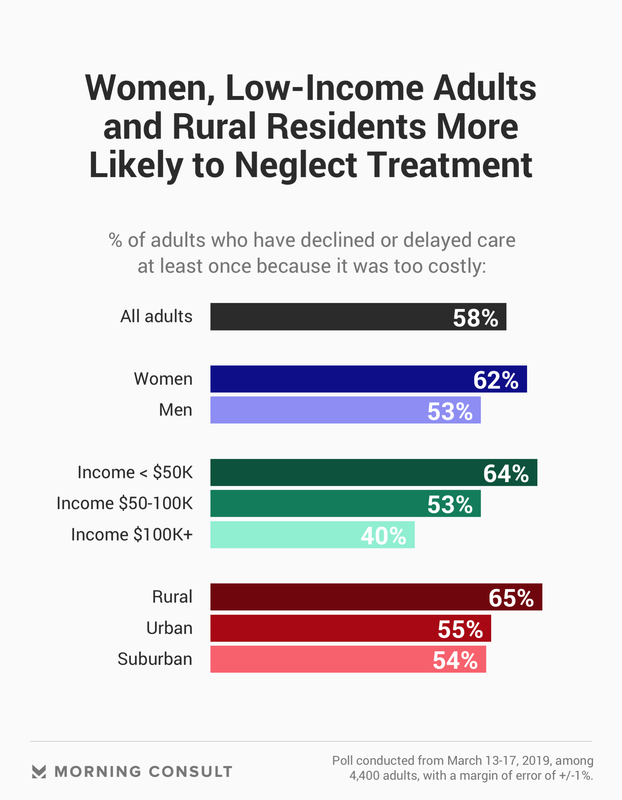 Fifty-six percent of this group say they have never neglected receiving care, compared to 2 out of 3 adults ages 45-54 who have declined care at least once. And no matter how far Republicans and Democrats diverge on health policy, here is one place where the two sides find themselves in lockstep: They were equally as likely to report sacrificing treatment or care for the sake of their wallet, with 56 percent of Republicans and 57 percent of Democrats having done so at least once. This story has been updated to include data on views by party affiliation.